Modern Manga (漫画) is associated with comics originating in Japan. Manga stories are usually printed in black and white, although colour versions do exist. These sketches are usually released as a series, presented in a single episode to be continued in future issues. There is another, older Japanese version of Manga; one that is described as sketches of landscapes, flora and fauna, every day life and the spirit world. To understand more about Japan's modern art in Manga, Anime and paintings, I needed to explore more about their past artwork, culture and influences. The history of Manga in Japanese art is well documented, and has existed in various forms since the late 18th Century. The Edo Period spanning just over 200 years was a major period for expression in art as a release from the strict code of laws. I could draw some comparisons to Japan's modern Manga and Anime, and see the evolution of Japan's early Manga to its current form. 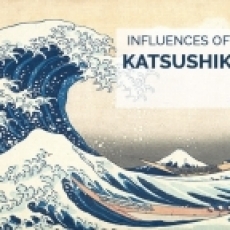 The ukiyo-e artist Katsushika Hokusai (葛飾北斎) published fifteen volumes from 1814 to 1878 of sketches that he called Manga, they are now referred to as Hokusai Manga (北斎漫画) Hokusai's sketches. They were originally intended as a guide for his students with various depictions of people, animals and nature. The sketches were published in book format in three colours only; black, grey and flesh coloured. Ukiyo-e woodblock printing techniques were complex and intricate. Some publications took many months to complete, similar to publishing a book today. During that time, carving out the Japanese writing kanji was time consuming as often each word was a unique symbol or pictograph, because of this the artists chose to include writing on the same page as the image. Hokusai's Manga became extremely popular, and the circulation of his publications over many years were facilitated by the ability of the common townsfolk to lend copies of the books from lending companies. This allowed a broader audience, where woodblock printing was used as a mass medium. Yoshitoshi Manga (1885-1887) was a series of various ukiyo-e by Tsukioka Yoshitoshi (月岡芳年) tales of long ago mukashibanashi (昔話) or folktales minwa (民話). It differs from Hokusai's Manga as this set was not a series of sketches but rather colour woodblock prints with a short text referring to a classic story. 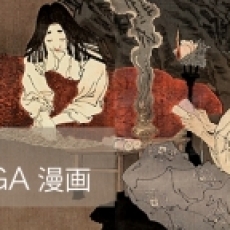 Some of these cautionary tales dated back to the Heian period (784-1185) retold with some variation which included romance, tragedy and the spirit world. Classic literature and poetry had often accompanied full page illustrations, and Tsukioka Yoshitoshi's Manga emerged following the Edo period, in the early part of the Meiji Restoration. Japan was in a transition period of modernization with the gaining popularity of photography (写真) shashin (formerly shashin 寫眞) which was utilized by that time for journalism; wood block printing was diminishing due to the opinion that the art form was no longer relevant. Sadly, ukiyo-e techniques of carving, pigment ink creation, washi paper production and tool making are becoming a lost art. There are very few woodblock printing artisans currently in existence, with only about 50 students spread across all of Japan. You have but to hear the dreamy legend of Urashima Taro to know the reason for its inspiring power over the artists of Fair Japan. On one of the Dragon Isle's balmiest days, when soft spring breezes listlessly floated over land and sea, an humble fisher-lad, Urashima Taro by name, left his native shores of Suminoye in his primitive fisher's boat. Intent on luring with temptingly baited line some prize from the laughing waters, he drifted, ere he knew it, far out to sea. The day was nearly spent in fruitless toil when, lo ! he caught a tortoise. You must needs know, as did Urashima, that a tortoise is a sacred creature to the Dragon God of the Sea, destined to live a thousand years if its life be spared; thus it happened that the wise lad returned the tortoise to its watery home. The boat glided on, and on, as Urashima kept at his labor, but naught did he find. At last, lulled by the rippling water and fanned by the softest zephyrs, he fell a-dreaming. And then it was the fair Daughter of the Dragon appeared to him in the form of a beautiful maiden, radiant in the sunset glow with a glory that belongs only to those of the palace of the great sea-god. It seemed that the tortoise Urashima so thoughtfully released had been the dragon's daughter in disguise ; inspired by deepest gratitude, she had thus approached Urashima, to whom she said, "Come home with me, to my father's castle beyond the sea, and if you wish I'll be your flower-wife, for this day you spared my life." Then Urashima's heart was glad, for never had he seen so lovely a being, and he yielded to her winsomeness right willingly. So she called a great tortoise, which carried them to the Dragon's Palace in the Evergreen Land of perpetual sunshine and brightness, where they lived for centuries in joy and peace. But the memory of his boyhood's home came back to him o'er and o'er. Try as he would, he could not cast it from his mind, so one fair day he said to the dragon's daughter, " I would go to my father and mother, if but for a moment's time ; after one fond look on the dear ones, I will come again to thee and my Palace Beyond the Sea." The Princess was greatly saddened at the words of Urashima, but she granted his wish, first giving him a casket that would protect him from all harm, providing it was not opened. Then came the parting, and ere long he was on his way with a gladdened spirit and lightened heart, soon reaching his journey's end. Once in his native village, however, he felt that some great change had come about ; his father's home was no more, the people whom he met were strange in features and in dress, even the fields once roved by his childish feet were gone—transformations great, indeed, since the day he had left it, but three short years before, as he believed! None of the passers-by knew of his father or mother. In vain he asked for news of them, until at length he met an old, old man who said that when a boy he had heard his father tell how Urashima's parents had died of grief on learning that their loved and only son had been swallowed by the sea while fishing, just four hundred years before! Then he knew he had been in a fairyland, living a charmed existence, with happiness and peace his daily portion. So he yearned long and deep to return to the Princess and his former life ; but he knew not how to reach the Palace of the Dragon King, for in the haste of departure he had failed to learn the means. He sought the coast and waited for the tortoise that had brought him, all in vain ; at last, in sheer despair, he thought of the box, the precious talisman the Princess had given him, and, forgetting her caution, loosed the silken cord that bound it, when out came a monstrous cloud of the fleeciest white, the very elixir of life and everlasting youth. As it escaped, slowly mounting to the sky, Urashima was transformed into a withered, enfeebled man ; thus he fell lifeless to the earth—more than four hundred years of age.